I would really be one of the early birds to pick this amazing pen up if this came a decade ago. However, with the whole growing up guy thing affecting my innocent lust for the unreal I now look at these Star Wars Lightsaber pens as just another interesting idea. 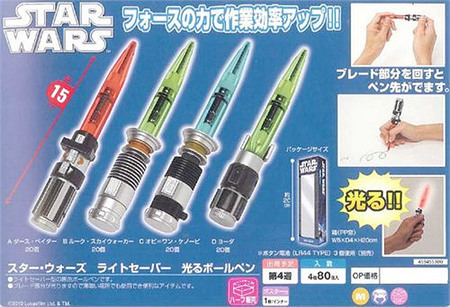 These have been created in collaboration with Taito and have a cool LED inside them that gives the whole effect of the light saber being brandished. So you have a ball pen that also emits light in a very Star Wars manner. Imagine all the kids in a classroom having this one and brandishing it before their knowledge imparting teachers. Epic. It will be available in October but NCSX is taking pre-orders for $9.80.